The Prophet (SalAllahu Alayahi Wasalaam) would not begin fasting Ramadan until there was a verified sighting of the crescent indicating the month or with the testimony of two trustworthy Muslim witnesses or just one witness. But when there was no sighting or testimony or the night of the thirtieth day of Sha’baan was cloudy and the crescent could not be sighted, he would complete thirty days for Sha’baan and then fast after that. He (SalAllahu Alayahi Wasalaam) would forbid that a Muslim fast a day or two days prior to the start of Ramadan out of precaution, unless those days coincided with days he normally fasted. 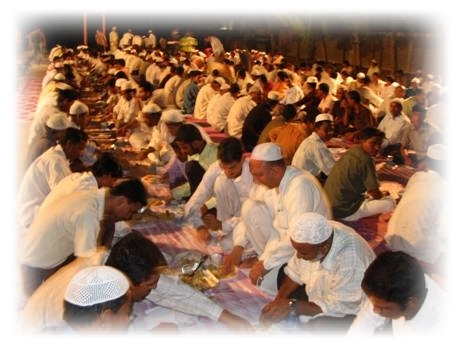 When He (SalAllau Alyahi Wsalaam) would travel in Ramadan, he would either fast or beak his fast and his Companions would choose between the two. So they would hold that whoever had energy and fasted then that was good and whoever was weak and broke his fast, then that was good. It was not from his (SalAllahu Alayahi Wsalaam) practice to estimate the point of distance in a journey for which a fasting person could break his fast. When his Companions would set out on a journey, they would break their fast without even having crossed outside of their homes. And they informed that this was His Sunnah. And it was from his (SalAllahu Alayahi Wsalaam) practice, that Fajr would come on Him while He was still in the state of Janaabah (sexual impurity), due to his wives, so He would bathe (make ghusl) after Fajr and then fast. He (SalAllahu Alayahi Wasalaam) would use the Siwaak while fasting. And He would wash his mouth and nose while fasting, but would not let the water go deep in his nose or mouth. He (SalAllahu Alayahi Wasalaam) would pour water on His head during fasting, due to thirst or the heat. He (SalAllahu Alayahi Wasalaam) would eat dates for His pre-dawn meal (suhoor) and He would incite His Companions to take the Suhoor even if it was only a gulp of water. And He would delay the Suhoor until shortly before Fajr. The time between His Suhoor and the Fajr prayer was the extent it takes a man to recite fifty verses from the Book of Allaah. He (SalAllahu Alayahi Wasalaam) would lead His Companions in the Taraaweeh prayer in congregation, then He stopped doing that for fear that the night prayer would be made obligatory on His ummah. But when He (SalAllahu Alayahi Wasalaam) died, this fear went away and the prescription for praying it in congregation remained, due to the Prophet's (SalAllahu Alayahi Wasalaam) saying: "Verily, when a man prays with the Imaam until he finishes the prayer, it is recorded for him that he prayed the (whole) night." He (SalAllahu Alayahi Wsalaam) would not go beyond making eleven rak'aat, whether in the month of Ramadan or any other time. Sometimes, he would say the Qunoot after finishing his recitation and before going into the bowing position, saying: "O Allaah guide Me with those you have guided, and forgive Me with those you have forgiven, and support Me with those you have supported, and bless Me in what you have given Me, and protect Me from the evil you have ordained. For You ordain all and nothing ordains over You. Truly, those you have befriended will not be humiliated, nor will those You have taken as enemies be honored. Blessed and raised High be our Lord. There is no security away from You except with You." In the second half of Ramadan, the Companions would say the Qunoot after rising from the bowing position, and they would add to it by cursing the disbelievers. So their Imaam would say: "O Allaah curse the disbelievers - those who hinder people from Your path and who deny Your Messengers and who do not believe in Your promise. And divide their ranks. And put fear into their hearts, and send your punishment and torment on them, O Lord of Truth." Then he would send Salaat upon the Prophet (SalAllahu Alayahi Wsalaam) and he would supplicate what he was able to of good for the Muslims. Then he would ask forgiveness for the Muslims. Then when he had finished all of this, he would say: "O Allaah, You alone we worship, and to You we pray and prostrate. To You alone do we hasten and rush. And we hope for Your mercy, our Lord. We fear Your punishment, verily, your punishment on those whom You have taken as enemies is severe and ever-increasing." And he would say in the last part of his Witr (either before the Salaam or after it): "O Allaah, verily, I seek refuge in Your Contentment from Your Discontentment and in Your Forgiveness from Your Punishment. And I seek refuge in You from You. The Praises for You cannot be accounted for, and You are just as how You have praised Yourself." After finishing the Witr, the Prophet (SalAllahu Alayahi Wasalaam) would say: "Subhaan Al-Maalikil-Qudoos" three times, prolonging his voice and raising it when reaching the third time. He (SalAllahu Alayahi Wasalaam) would pray two rak'at after the Witr and he would command his ummah to do that. And He would recite in them Surah Al-Zilzaal and Surah Al-Kaafiroon. When the last ten days of Ramadan would come, He (SalAllahu Alayahi Wasalaam) would tighten His garment, stay up at night (worshipping) and wake up His family (to pray at night). And He would exert Himself in these last ten days the way He didn't exert himself in any other days. When He (SalAllahu Alayahi Wasalaam) would want to make 'Itikaaf, He would pray the Fajr prayer (in the masjid) and then begin His 'Itikaaf. He (SalAllahu Alayahi Wasalaam) would set up a small tent in the back of the masjid in which He would perform the 'Itikaaf and He would place His bed and mattress there. He (SalAllahu Alayahi Wasalaam) would permit some of His wives to visit Him while in the state of 'Itikaaf, and He would depart from them in the door of the masjid. He would not be intimate with them at this time, whether by kissing them or other than that. And He (SalAllahu Alayahi Wasalaam) permitted a woman to make 'Itikaaf with her husband or by herself. While in the state of 'Itikaaf, He would not go out from the masjid unless He had some humanly need. Allaah's Messenger (SalAllahu Alayahi Wasalaam) obligated the Muslim and those he provides for, young and old, male and female, free and slave to give a saa' (around 2 kilogram) of dates or a saa' of barley or a saa' of dry cheese, or a saa' of raisins or half a saa' of wheat, or a saa' of the food of the people's land. He (SalAllahu Alayahi Wasalaam) would give it out in food and not cash. It was from His (SalAllahu Alayahi Wasalaam) practice to give the Zakaat-ul-Fitr a day or two prior to the 'Eed prayer. It was from His (SalAllahu Alayahi Wasalaam) practice to specifically give the Zakaat-ul-Fitr to the needy people (masaakeen). And He (SalAllahu Aalyahi Wasalaam) would not divide it separately for the eight categories of people mentioned in Surah At-Tawbah (60). He (SalAllahu Alayahi Wasalaam) would appoint one of His Companions to collect and guard the Zakaat-ul-Fitr. For the evidences on these issues and for what will follow on the Rulings of Fasting, refer to the following books: "Fasting in Ramadan" of ‘Alee Al-Halabee and Saleem Al-Hilaalee, "The Night Prayer" of Shaikh Al-Albaanee and "Zaad Al-Ma’aad" of the great scholar Ibn Qayyim Al-Jawziyyah.